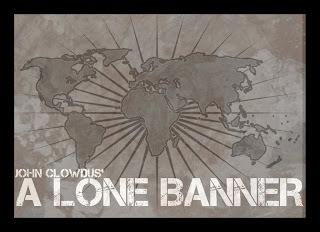 I recently got my order filled by Small Box Games, which included the new, and very fun, A Lone Banner. It’s a light wargame that looks very simple at first glance, but is surprisingly fun and is easily the quickest Small Box Games product to learn and play. Further, the art and font choices are exceptionally easy on the eyes, thematic, and take me back to 1983 when the old film classic, “War Games” was released. When I got my wife and daughter at the table to play this, I even said, in a faux-computer tone, “Would…you…like…to…play…a…game?” They didn’t get it, but that’s OK, we can’t all be geeks. The concept of A Lone Banner is very simple: Players assume the role of a world leader who is attempting to take over the planet using limited troops, guile, and sheer brute force. 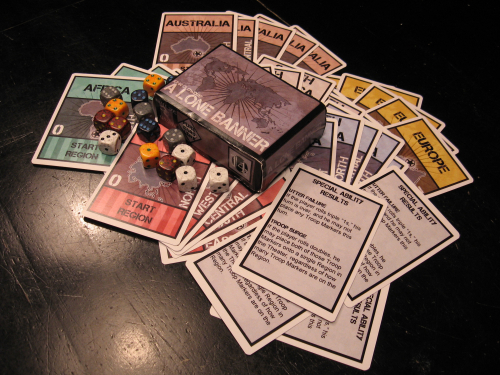 Players start with one starting region of Earth and, using dice to represent troops, slowly take over the planet in a systematic global invasion. The dice values represent the strength of the corps or divisions of troops players command to invade territories for both victory points as well as invasion routes to other players’ conquered territories. All in all, it’s as cut-throat as they come, and it’s a brilliant design for a very light, very fast war game. The components are not the typical Pure Card Line fare, either, because there’s only about 40 cards in the deck, but it also comes with four colored sets of three dice and a fifth set of four white dice. The art on the cards is very nice, even though it’s simple, and the graphical layout is excellent. I say simple because there really is only about seven pictures total in the entire deck, but I happen to dig them all. I especially appreciate John hearing the clarion call of his fans for him to use readable fonts again, because he actually used one of my all-time favorites on this one, and it’s perfect for the theme. The dice are really neat little 16mm jobbers, and I really like the speckled colors. All in all, the quality is great, as usual, and the inclusion of these neat little dice makes me one happy guy. Well worth the thirteen bucks! To set the game up, you need to randomly hand out one “Starting Region” card, which essentially acts as your nation’s headquarters, and then hand out one white die and a set of three colored dice. The last step in setup is to create a “Region Deck” which contains all of the cards that are not Starting Regions, and then to place one card for every player face up in the center of the battlefield. These cards act as the contested regions that are not aligned or otherwise conquered by a given player, and these are the main source of victory points. On each player’s first turn, they will roll their three colored “Troop Marker Dice” and determine the strength of their divisions. You may reroll any die you wish, except if you’ve rolled a one, in which case you’re stuck with that. In certain circumstances, you may roll doubles, triples, or a straight, at which time special powers will come into play if you choose to keep those values on the dice, such as immediately taking an uncontested Region, placing multiple dice on the same Region, or moving opponents’ troop markers off of a Region. Once you’ve opted to keep all of your dice, you may place one of them onto a contested region you wish to conquer, or if an opponent has a Region conquered already, you may place a die on that Region, effectively invading it. Regarding invasions, you must have a path to invasion before actually invading it. For instance, if an opponent has conquered the Southern region in Europe, you must have conquered a card with the “Invasion: Europe – South” path on the card to be able to invade that Region in another player’s tableau. On the first turn this generally doesn’t matter, but on all subsequent turns, this is a big part of gameplay. To resolve an invasion, the player who attempts the invasion rolls the white die and adds that to the value of the Troops they placed on the Region, and the defender rolls a white die and adds to the rolled value the number of Regions that he owns on the continent that’s being invaded. The highest value conquers, or retains, that Region. Anyhow, back to the first turn. If a player has previously placed a die onto a contested Region and one or more opponents have subsequently placed a die onto that same Region, it’s time for a battle. The white die is rolled by all combatants, and adding the white die to the colored Troop die is your overall attack value. The highest roll allows you to take control of that Region, taking it from the center of the table into your own tableau. In the case of a tie, everyone takes their dice and goes home. Another action you may take on your turn is the Recon action, which allows you to get swap a Region that is face up with a new card from the deck, but only if the card you wish to swap isn’t occupied by any Troops. All in all, it’s a game that takes half an hour to play, is really decent to look at, and is fun as hell. I really liked it, and so did my wife, my daughter, and the friends I’ve played this with. It’s so simple, yet so complex, all in one. Best of all, it’s as cheap as your half of a Dutch date at Olive Garden. – This isn’t Pure Cards. He lied about that….? This is the perfect filler game, and unless you’re so afraid of dice that you consider moving to Germany at the sight of them, you will like this game. There’s a little too much cut-throat for some, I’d imagine, but the game is just simply a load of fun and quite brilliantly executed from a design perspective. This is one of the best of Small Box Games’ Pure Card Line, which is ironic because it’s the one game in the line that isn’t just cards. John nailed this one, and were this a 2-player game, I think it may have even beat out my favorite 2-player card game, Bhazum. Great stuff, and for 13$ the price is perfect. Preorders for December are closed, and I’m sorry for not getting this out earlier so y’all would know about it for Christmas. Trust me, this is one you want. Preorders open for this again in January, though! Previous PostConquest Of The Fallen Lands – Is That A Stronghold In Your Pocket Or Are You Just Happy To See Me?Next PostSocial Commentary – Enough with the denominations, already!